Just lovely, lovely, lovely. Now, over the years we've learned at Beauty Bible that if there's one smell which pushes our followers' buttons, it's rose – which means you're going to swoon for this, with its armfuls of roses, sustainably harvested in Turkey, where Fresh have long had a rose project under way. What we've also learned is that when you love using a product, you see optimum benefits – because the pleasure factor encourages you to apply it diligently and regularly. 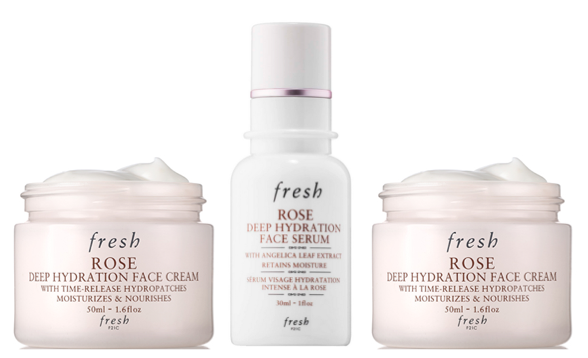 There are two new products in Fresh's Rose collection, both of which offer skin a deep moisture drink. The first - Rose Deep Hydration Face Serum – has already scooped a 2016 Star Beauty Award: powered by hyaluronic acid, moisture-boosting angelica leaf extract, a 'smart' algae - and infused with rosewater and cooling cucumber extract – it makes skin look instantly vibrant and plumped-up. The second is Rose Deep Hydration Face Cream: more of a gel-cream texture, to us, showcasing many of the ingredients featured in the serum, amplified by rose and plum seed oils. Both products are now – hallelujah – available via a Fresh UK website, something we waited years for. There's also a fascinating video about the Fresh rose harvest which you can watch here – wallowing in the sight of the petals while you're skin's getting a darned great drink.